Through the examples presented in this handout, you will learn how to calculate electrical energy consumption, and discover how simple changes around the house can help you conserve energy and save money. The amount of electrical energy consumed by different appliances is reported in kilowatt-hours (kWh) and one kilowatt-hour is equal to 1000 watts. Assume a laptop uses 50 Watts per hour. If the laptop is used for 8 hours a day, how many kilowatt-hours of electrical energy will it use each month? This is a 23-watt energy efficient light bulb. You can buy this light bulb for about $3.00. It is estimated to last 9750 hours or approximately 13 times longer than the average light bulb. This is your average 100-watt light bulb. You can buy this light bulb for about $0.50. It is estimated to last 750 hours. In order to get the same amount of life as the energy-saving bulb, you would need to purchase 13 of these incandescent light bulbs. Remember: We are comparing the energy consumed over a life of 9750 hours (a little over 1 year). Imagine a light fixture in your home, which holds five energy-saving light bulbs. In an attempt to conserve energy, you remove one of the bulbs from the fixture and use only four of the bulbs. a) How much energy do you actually conserve in a given month? Assume each bulb is 23 Watts and you leave the fixture on for 12 hours each day. b) Assuming you are charged $0.10 per kilowatt-hour of energy consumed, how much is your monthly saving on your energy bill? c) How much is your annual saving? A photovoltaic system captures solar energy and converts it to electricity. Use www.gridc.net under "Data Export" to answer the following questions. You may also want to look at the guide on instantaneous data versus cumulative data to help you with the following activity. 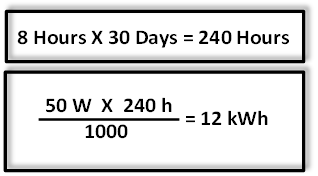 a) Determine how much electric energy was consumed by the Solar House over an averaging period of a week (House - House Energy Consumed), and how much of this energy was provided by the PV panel (Annex - PV Energy) as well as the wind turbine (Annex - Wind Turbine Energy). Use an averaging period of a day. b) Assuming that each kilowatt-hour of energy is $0.10, how much money did the Solar House save in the previous week by using electrical energy produced by the PV and wind turbine? c) What percentage of the total energy consumed by the Solar House was supplied through the PV and wind turbine?